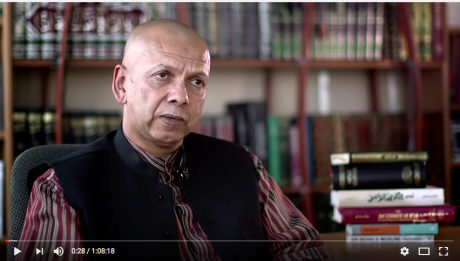 Screenshot of Farid Esack, Head of Religious Studies, University of Johannesburg. Israel Apartheid Week 2017 speaker.YouTube.Recently petitions and letters have been circulating protesting at the British Government’s adoption of the International Holocaust Remembrance Alliance’s definition of antisemitism. They argue that the IHRA definition of antisemitism dangerously conflates political speech critical of Israel, or in support of Palestinian rights in the Occupied Territories, with antisemitism. The letters and petitions respond in part to campaigns against annual Israel Apartheid Week seminars in the UK, which have cited the IHRA definition in their initiatives to shut down such events. The protests against the government’s position on the IHRA definition are broadly correct in their assertions about the danger’s of the government’s actions. But there are some aspects of the situation that warrant slightly different emphases than most of the letters and petitions have made. But what does “criticism” mean? What are the criteria for “similarity”? One can imagine a comparison between criticisms of the United States, Britain and Israel. It would be impossible to understand the history of the United States without acknowledging the centrality of slavery, the dispossession of Native Americans, and racism that governed the attitudes of White Americans toward both. Modern Britain would be incomprehensible if one tried to erase colonialism, underpinned by violence and its own forms of racism, from the narrative. The experience of American slavery and British colonialism respectively, while by no means isolated or somehow “incomparable” to other histories, is nonetheless particular to each country. By the same token Israeli history is incomplete without discussing the role of settler colonialism in the founding of the state, and subsequently the dispossession of Palestinians’ rights through occupation of the West Bank and Gaza Strip. Just as histories of the United States and Britain must reckon with the specific legacies of their pasts, so must histories of Israel. 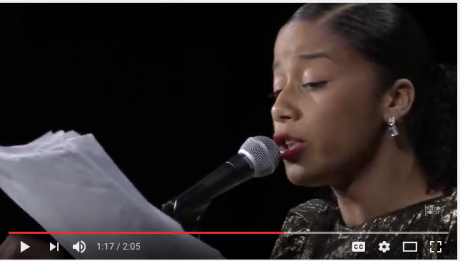 Screenshot: Aja Monet, poet. Israel Apartheid week 2017 speaker. YouTube.But in practice it is difficult for anyone to delve into the history of Israel or its current policies of occupation without risking vilification or, increasingly, being silenced altogether. This year’s Israel Apartheid Week addressed “100 years of Palestinian resistance against settler colonialism, since the inception of the Balfour Declaration,” seeking to link that endeavor to campaigns calling for Boycott, Divestment and Sanctions against Israel. Settler colonialism, as previously mentioned, is an inescapable part of Israel’s history as a state, just as slavery and colonialism are part of the history of the United States and Britain. Sanctions, the goal of BDS advocated by Israel Apartheid activists, are a tool often used by the British government. For example, sanctions were applied against Iraq before the 2003 invasion, Iran before the 2015 nuclear deal was signed, and Russia (ongoing, due to the Russian occupation of the Crimea in 2014). An additional 19 countries have been sanctioned by the UK at various levels and for various periods over the past few decades. The imposing of sanctions and their subsequent lifting once conditions have been met suggest that they are an effective tool of diplomacy. There is therefore nothing exceptional about advocating sanctions against Israel. Nonetheless contrary to the spirit and letter of the IHRA’s disclaimer clause, individuals and organizations have explicitly sought to link Israel Apartheid Week to antisemitism on the basis of the IHRA definition. The IHRA’s nominal attempt to define when criticism is legitimate is, in practice, inoperable. Why should this be so? If the IHRA’s definition of antisemitism were used as a talking point for a debate it might be a productive document. The problem arises from the fact that the government of the United Kingdom has “adopted” IHRA’s definition in a quasi-official manner, and has therefore put itself in a position to tell us when it thinks a speaker or a topic is anti-Semitic, or to encourage others to do so. Crucially, this does not come in a vacuum. The government’s position on the IHRA definition must be put in the context of its ‘Prevent’ legislation, which has been the law since 2015. Prevent is ostensibly part of a counter-terrorism strategy, but in every way it actually feeds radicalization by encouraging or in some cases requiring universities to censor speakers and to conduct surveillance on students. Prevent erodes trust between students and faculty and actually creates reasons for radicalization rather than impediments to it. The Prevent legislation is deeply malignant to the cause of free speech in universities. Prevent conflicts with the Education (No. 2) Act of 1986, which was designed to uphold freedom of speech in universities. The 1986 legislation might be seen as either invalidating Prevent altogether, or as functionally analogous to the IHRA’s ineffectual disclaimer clause. It will ultimately be the latter. One notes that the Prevent Duty Guidance document mentions the 1986 legislation ominously, as something to be subject to “further guidance issued on the management of external speakers and events.” “Further guidance” will not be in the interest of freedom of speech. Once Prevent became law it was allotted bureaucratic resources, administered through the Higher Education Funding Council of Britain, in order to compel compliance. As a bureaucracy of the state, HEFCE’s Prevent apparatus can only demonstrate its productivity in the form of narrowing the limits of academic freedom. Its purpose is precisely to peel away issues that can be defined as outside the scope of academic freedom. If it fails to do this, the Prevent bureaucracy will not be seen as effective. In this context, consider the implications of the government’s “adoption” of the IHRA definition of antisemitism. The “adoption” of the IHRA definition of antisemitism is vague and quasi-official, but there is nothing quasi about Prevent. Combining the adoption of the IHRA definition of antisemitism with Prevent is very dangerous indeed, and results in exactly the conflations of political speech with antisemitism that so many have protested. Moreover, third parties seeking to suppress free speech on Israel in universities have explicitly linked the adoption of the IHRA definition with Prevent. 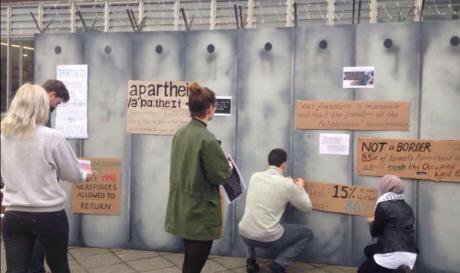 University of Cambridge protest, Israel Apartheid week 2017. Cambridge University PalSoc.This brings me to the most crucial issue, which is that Prevent empowers a range of non-governmental entities to decide for us whether or not we have met the criterion of criticising Israel in a manner “similar to criticism of any other country.” In other words, third parties from outside the university can make complaints against speakers at our events, and Prevent obliges universities to investigate these complaints. These non-governmental entities may include the right-wing press operating in a realm of “alternative facts,” as well as organizations or individuals who simply wish to suppress discussion of facts they consider opposed to their political agendas. Universities struggle to devise sensible policies for handling such interventions. The government's adoption of the IHRA definition of antisemitism raises the likelihood of politically motivated interventions into our affairs, and weakens our defenses against them. Hence the IHRA definition becomes not a tool put into the hands of people concerned with antisemitism, but instead a weapon put into the hands of those who wish to suppress activists and academics speaking on Palestinian issues. It also becomes hugely threatening to timid university administrators who are nervous about granting authority to speak on topics considered controversial by the dictates of Prevent. If current trends continue, soon we will be unable to speak critically about Israel or in favor of Palestinian rights in the Occupied Territories. Other issues will be similarly peeled away from the sphere of allowable speech. Prevent is fundamentally anti-intellectual and ultimately counterproductive to the cause of security. This is because it encourages or demands silence rather than discussion. Silence leads to ignorance, which can never make us more secure. The same tactic can potentially be used to suppress all speech at odds with the state’s agendas, or with the agendas of unaccountable people and organizations. I predict that in the case at hand the government's adoption of the IHRA definition will not stop a single antisemitic act, and that it is dead certain to continue suppressing legitimate political views critical of Israel. This is what the government’s adoption of it is designed to achieve. But what is happening now to Palestinians and their supporters is part of a much larger assault on freedom. The government’s quasi-official adoption of a definition of antisemitism has nothing to do with preventing antisemitism, and everything to do with a malicious spirit of authoritarianism now sweeping the world.